Here’s the point: you can’t begin to work out what marketing methods are most likely to give you the results you need unless you actually know what the results are that you need. Pretty much all of the marekting methods and techniques will work to a greater or lesser extent, and some are more effective with certain types of prospects than others, so before you can work out what you should be doing you need to know a few other things – like what number of enquiries you need to make it worthwhile. Simple. Yet, often ignored in the rush to get busy being busy. 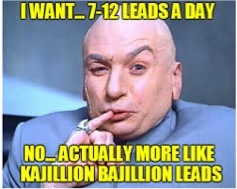 In this Quick Tips video we discuss what goes into working out how many leads you actually need – which in turn will give you some pointers to what sort of marketing you should be doing.